Haaker immediately took control of the first race. Breaking away from the rest of the field, he secured his first victory of the night. Cody Webb seemed uncomfortable from the start and failed to really find his rhythm. The KTM factory rider, who was leading the championship coming into Madrid, made a few too many errors and had to settle for 3rd. Taddy Blazusiak simply couldn’t keep pace with Haaker, but still was second in the first race. A huge pile-up early in race two (the reverse grid race) caused carnage when Kevin Gallas failed to get over an obstacle and several riders collided in a domino effect. Haaker and Blazusiak were worst affected as they went down and remounted last. Cody Webb, meanwhile, raced to victory despite starting on the second row. Haaker was furious at his misfortune and made up ground quickly. He made his way close to the front and was in the fight for second with Pol Tarres. Blazusiak also put in a monumental effort to catch up with Colton. 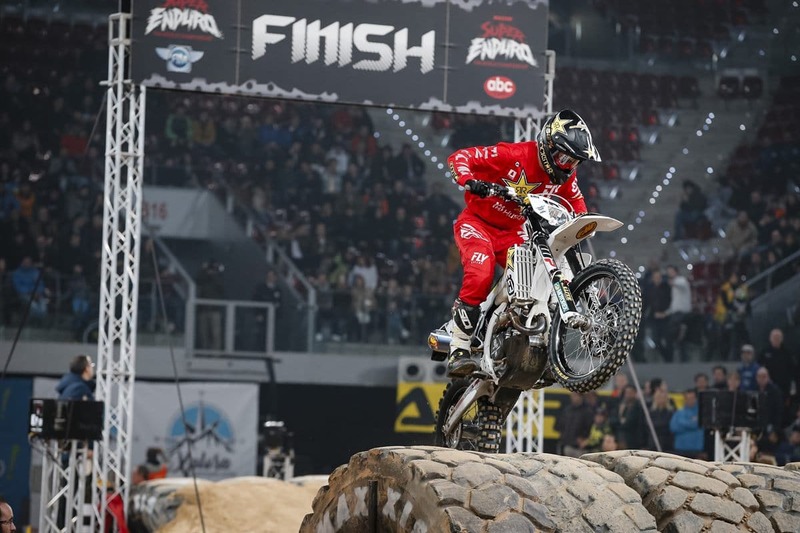 At the finish, the pair collided in mid-air in one of the most spectacular yet terrifying Superenduro crashes ever. And while Haaker’s Husqvarna flew over the finish line without its rider, Taddy’s KTM fell short of the timing beam, meaning a devastating DNF for the battered and bruised Pole who required medical attention. With the overall win up for grabs, Haaker delivered his best performance of the night in race three. Riding to a commanding 26-second margin of victory, he secured the top step of the podium and took control of the championship lead. Webb, was running second until is KTM suffered a derailed chain. Blazusiak was down again, making Spain his worst race in years. Colton HAAKER: “ the end result is awesome but it was an up and down night for me! It was nice to bring home the first race but in race 2 I came over the tanks and there were four guys in the valley and I had nowhere to go. I followed Cody into it and he made it through cleanly but me and Taddy didn’t and we were tangled together. We seem to find each other together all the time… Probably cos were both so aggressive. Over the final jump we raced to it and came together and it was an explosion of bikes and people. It was noones fault cos we both were racing for the flag. It was tough to put that behind me but I tried to be clean in final 3 an dat the start I had someone behind me but then suddenly he wasn’t there. It’s hard for Cody but chains breaking can happen. “. Cody WEBB: “That was a crazy night! It’s a freak accident for the chain to make and its tough because I felt good just before the chain broke. I pushed the bike to the outside and the team brought me a chain and I tried to change it as quick as I could to score a point. I didn’t think any of us would open a double digit lead but two crashes for Taddy and my chain means that Cody has an edge. We’ve all been riding super hard this year in every race but now Colton has a lead and it’ll be interesting to see if he starts riding defensive. I’ve only points to gain“.